Custom kitchens can do miracles with your interior design as they will utilize the space to the max, while at the same time they will give your home a thoroughly unique look. The important thing about them is the fact that they do require a preliminary design. True, architects and interior design studios can optimize your idea; however, it will be much easier if you have a rough plan at least. The best possible approaches for custom kitchens are two – the design and the layout can be synchronized with the existing electrical and plumbing installations or the whole kitchen can be designed to match your exact specifications without taking them into consideration. Of course, the second approach would be much more time and money consuming, but after all this is why we call them custom kitchens, right? This is how greater comfort and a higher level of functionality will be achieved. Another restriction in our master plan would be the dimensions of the room. Therefore, we should make sure that we utilize every inch of it. The majority of kitchens have a normal T-shaped layout; however you can change that depending on your preferences. When getting a custom kitchen, you need to pay special attention to the corners – you can have tailor-made cabinets with numerous drawers, which will allow you to utilize the space better than if you use simple shelves. The individual designs are performed by skillful professionals, which will also help you decide on the most comfortable and functional kitchen appliances. Keep in mind that apart from the general concept, you should also consider the details, so that your idea can materialize in the best possible way. The important factors that influence the custom kitchens vision include the following: the cabinet panels, natural and artificial veneer, kitchen boards, paint, stainless steel, granite surfaces, etc. Every detail matters, so give it a good thought! 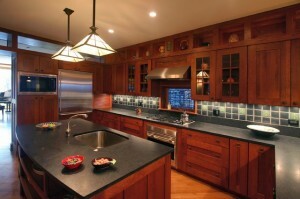 Kitchen Design, Tips custom kitchens, custom kitchens design, custom kitchens in our normal homes, custom kitchens layout, tips for designing your custom kitchen. permalink.